Heat oven to 400°F. Separate dough into 10 biscuits; separate each into 3 layers. Arrange biscuit rounds on 2 ungreased cookie sheets. Sprinkle rounds with cornmeal. Bake 7 to 11 minutes or until golden brown, switching position of cookie sheets halfway through baking. Remove from cookie sheets; place on cooling rack. Cool completely, about 10 minutes. 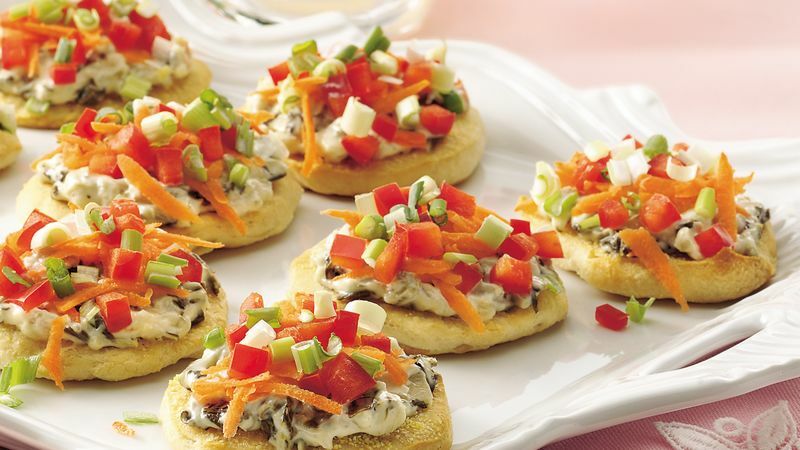 Spread each baked biscuit round with 1 1/2 teaspoons spinach dip. Sprinkle each evenly with carrots, bell pepper and onions. Cover; refrigerate at least 1 hour until serving time. Instead of the spinach dip, try another flavor, such as dill or ranch.